The FINNLO Bio Force multi-gym will wow you with its innovative resistance technology, attention to detail and countless exercise options. The innovative technology found on the Bio Force opens new doors for strength training in small spaces. The employees of the European Astronaut Center (EAC) in Cologne, Germany have been using the Bio Force for years to optimally prepare for their missions in space, since the innovative TNT nitrogen technology works even in zero-G. The Bio Force is designed like no other multi-gym on the market, and its modern technology and functionality helped make it the stand-out test winner in Men’s Health magazine. Nitrogen cylinders, snap-resistant cables and ergonomic design combine to make the Bio Force the ideal multi-gym for the home. Instead of conventional weights, the Bio Force multi-gym uses innovative TNT nitrogen technology (Total Nitrocell Technology). Two cylinders on the back of the Bio Force generate an extremely consistent and jerk-free resistance – even at high intensities. Each cylinder is sealed and filled with nitrogen. Inside, they contain a moveable piston rod that provides light to strong compression according to the resistance selected. The clanking and banging of conventional weight stacks is now a thing of the past. Fatigue testing revealed no signs of wear even after 100,000 repetitions. The sealed cylinder system ensures extremely long lasting durability and is especially safe for kids since there are no dangerous weight stacks. The slide-and-lock mechanism lets you instantaneously change resistance in 2.25 kg increments without leaving your seat. This is true training convenience: Simply lift the knob, slide the controller and let it lock at the desired intensity (resistance is shown in pounds) and you’re done, making it perfect for supersets! With total resistance ranging from 100 to 125 kg depending on model, you can select as high as 62.5 kg per side. High-quality, heavy-duty plastic-sheathed steel cables ensure safety and years of training enjoyment. Ball bearing-mounted pulleys provide friction-free power transfer. And there practical too - clipping easily to the different hooks on the Bio Force for different exercises, letting you target individual muscle groups. Shoulder-level pulley hooks let you do bench presses - the gold-standard of strength training - at four different widths, each targeting different muscle fibers for definition. And what would a multi-gym be without a lat bar? The high-quality nonslip Bio Force lat bar guarantees a professional-grade back workout. When not needed, it rests securely on its own hooks. Comfortable ergonomic cushioning adjusts to fit you and accommodate different exercises The seat has two height settings and detaches via a handle when needed, giving you room for even more exercises standing up or lying down and letting you do intense leg workouts for your thighs and glutes even better. The removable seat also allows wheelchair users to strength train on the Bio Force multi-gym. The heavy-duty, anti-slip handles are sweat-resistant for long durability. 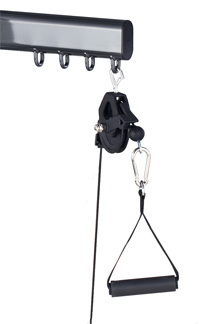 Bio Force Accessory Set with leg straps, metal handles and triceps rope lets you do even more. Whether it's for your abs, arms, shoulders or back, the Bio Force does it all. For those just starting out with strength training, professional support is indispensable. So we've thrown in a manual illustrating the best exercises for strengthening all parts of your body. A DVD will also show you how to get the most out of your Bio Force. Adjustable seat fits lifters between 1.50 and 2.00 meters tall. The seat locks at two different heights for optimal training position at all times. It can also be removed for intense standing and lying exercises for comprehensive and varied muscle training. The removable seat also allows wheelchair users to strength train on the Bio Force multi-gym. Pulleys can be clipped to 13 different pulley hooks, located both high and low on the frame. The generous number of hooks enables a host of different training positions and strength training from different angles to push your muscles to the limit and ensure a wide variety of strength exercises. 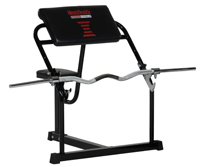 The adjustable preacher bench will create a fitness studio feeling in your own home. The oblique bench keeps tension to a maximum during biceps training. Just clip both cables to the EZ-bar and you're ready to curl. The preacher bench is one of the best tools for isolating your biceps. The Power Bench is the perfect accessory. 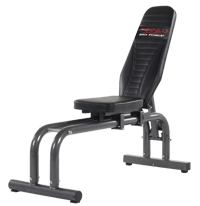 With a seat angle that adjusts from 0 to 80 degrees, it lets you do additional hard-core upper body exercises. Simple clamping mechanism connects the Power Bench to the Bio Force in a snap. 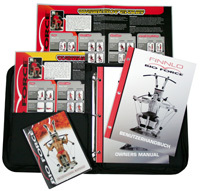 The accessory set lets you do even more exercises. 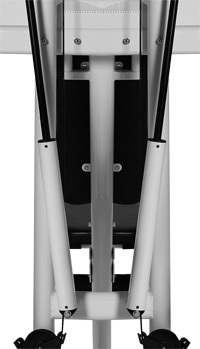 Three different handles are the optimal complement to the Bio Force multi-gym. It includes a triceps rope along with universal metal handles and comfortable nylon ankle straps for various cable-pulling exercises. The Bio Force Accessory Set can be neatly stowed in a bin that fits perfectly into the Bio Force floor. 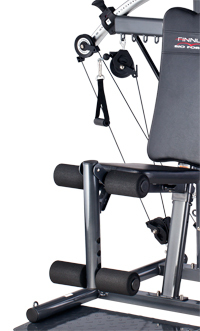 The 3-way adjustable leg extension unit fits all body sizes. Foam padding ensures comfortable leg exercises (for hamstrings/quads). Two built-in transport rollers make moving the Bio Force trainer a piece of cake: simply tilt and roll. 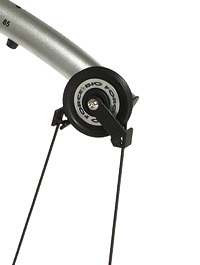 With its lightweight construction, the Bio Force weighs only 67 or 78 kg, depending on model. 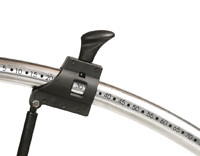 The grab bar provides a measure of safety when exercising standing up. For exercises demanding your coordination, it gives you the necessary support so you can concentrate 100% on the exercise. Please note: The entry-level model Bio Force Basic does not inclued a grab bar. The anti-slip metal platform provides you with secure footing during all standing exercises.